Football season means it is time to tailgate, and no gameday is complete without bacon! 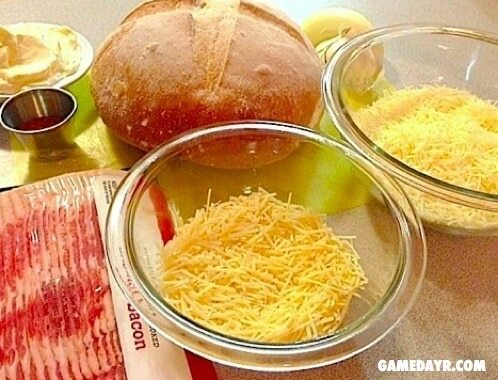 Here is your bacon tailgating recipe of the week. In a medium pan over medium heat, cook the bacon until crispy. Remove bacon and place on a paper towel to drain. Meanwhile, using a cerated knife, slice the top quarter off the loaf of bread and set aside. Carefully hollow out the inside, leaving a 1 inch shell. Cube removed bread and set aside for dipping. Reserve three slices of the cooked bacon (for step 8). Once cool, crumble the remaining bacon. In a large bowl, combine crumbled bacon, cheeses, mayo, onion, garlic, and cajun seasoning; stir until well combined. Spoon cheese mixture into bread bowl and place it on a foiled baking sheet. Cover dip with the top quarter of the bread and bake for 20 minutes; remove top of bread and continue to bake for another 20 minutes, or until hot and bubbly. Remove bread bowl and allow to cool for at least 5 minutes. Crumble the remaining three slices of cooked bacon and use to garnish. Serve with bread cubes and crackers.